Salzburg has been the capital of a Catholic state for centuries and the more than 20 major churches (most of them in Baroque style) are still the dominating feature of the Altstadt or Old Town. The most recent additions, modern churches from the 1960ies, can be found in the outskirts of Salzburg. The oldest around the area of the Salzburger Dom, the cathedral. In addition to churches, there are dozens of other references to religious practice, almost all of them to Catholic faith. To learn more about the city′s religious past, note our article on the history of Salzburg - the quick timeline will tell you that the Bishopric of Salzburg was founded by St. Rupert in the late 7th century. In the Middle Ages, this Bishopric became a wealthy Archdiocese and ceded from Bavaria to form an independent principality within the Holy Roman Empire of German Nation. The prime of Salzburg came in the late Middle Ages, when mining boomed in the mountains. After the turbulent years of peasant wars and the reformation in the 16th century settled with the expulsion of the Protestant part of the population, Salzburg finally saw its peak: The Prince Archbishops of the early 17th century transformed the Medieval city into the Baroque gem you see today. The three most important ones were Wolf Dietrich von Raithenau, Markus Sittikus and Paris Lodron, who all built one church, palace or piazza after the other. Note that this was done during a period in which the neighbouring regions in Central Europe were burning, as the 30-Years-War waged. Only rich little Salzburg could stay out of the hassle and managed to do rather well until the Napoleonic Wars wiped away its independence. 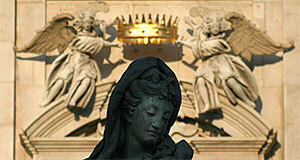 Today, more than 55 percent of the city′s population is of Roman Catholic faith. The next biggest group of believers are Protestants and Muslims with some 7 percent each. There is an increasing number of Orthodox Christians living in Salzburg, even though most of them are of the strange Habsburgian Ukrainian-Catholic sort (simplified, they are Orthodox in liturgy and practice, but integrated into the Roman Catholic church). All other religious groups are tiny and rather negligible. If you want to make the Christian heritage of Salzburg a theme for a sightseeing tour, you will find plenty of things that will be worth noting. See for example our list of churches in Salzburg; the biggest and most important ones are the Salzburger Dom, the Franziskanerkirche, the Stiftskirche of St. Peter, the Stiftskirche Nonnberg, the Kollegienkirche, the Blasiuskirche, Markuskirche, Müllner Stadtpfarrkirche, the Kajetanerkirche, Erhardkirche and Kirche St. Michael at Mozartplatz; and on the other side of the Salzach River the Dreifaltigkeitskirche, the Kirche St. Sebastian and the Kapuzinerkloster (Capuchin Monastery). Beyond that, there will be several cemeteries you might want to note. See also the Salzburg Museum for some history and note the Dommuseum and Domgrabungsmuseum. There are several old pilgrimage paths that cross Salzburg. Note for example the one to the Basilica Maria Plain. Recent years saw also a re-discovery of major European routes of Pilgrimage, such as the way to Santiago de Compostela. There are a couple of entrance points to this route where you can enter the path in and around Salzburg. Note that there are several religious organisations (some of them monasteries) that have guest rooms or accommodation. We have included those in our article on "hostels and cheap accommodation", since they usually offer a basic service for relatively little money. Some of these places also offer something like "religious holidays", to live with the community for a few days or weeks. Such arrangements are not always made individually - the Pallottiner community on the Mönchsberg, for example, offers courses in silent meditation. The following four religious facilities offer regular guest rooms; others, such as convents, will generally do so only to "real" guests of their communities. See also our "hotels" section for further lodging information!